We’ve created a film of our Accelerate Climate Action tour with world-renowned author and environmentalist 350.org co-founder Bill McKibben for people everywhere to share in their communities, to inspire individuals to take action. Attend a feature-length premiere near you – check back for new screenings – or host a screening of the shorter, 30 minute community film in your area! This is a film with an important and urgent message as we head towards a crucial ‘climate change election’ in Australia, and we want as many people as possible to see the movie as part of our Vote #1.5 election campaign. That’s why – as well as premiere screenings of the feature-length film in cities in the coming months – we have created a 30-minute version of the film that anyone can show in their community. This is the perfect length to watch the film, have a group discussion after, and then plan your next steps for taking climate action in the coming months. Will you step up and host an Accelerate screening in your community as part of our Vote #1.5 election campaign? 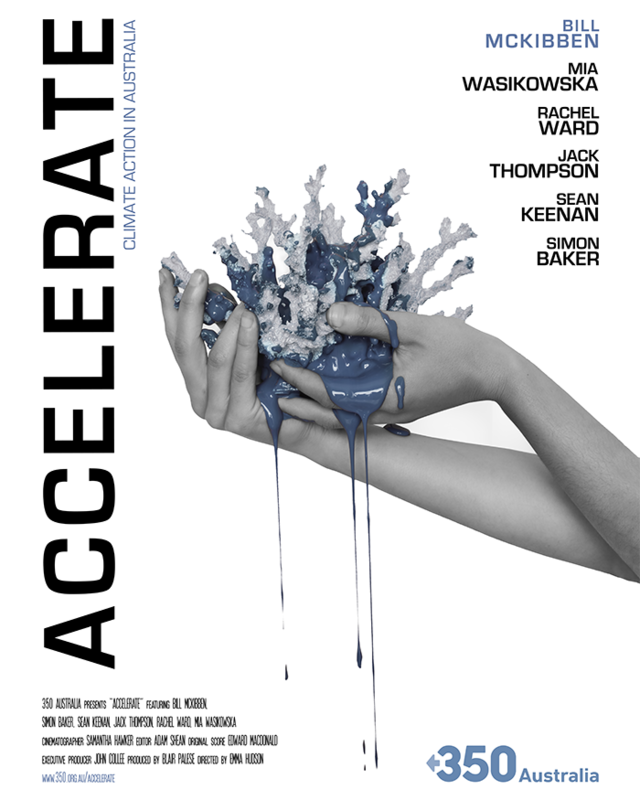 Sign up now to host an Accelerate screening in your community, and we will send you an organising guide and the film link. To explain how ordinary people can take action, world-renowned author and environmentalist 350.org co-founder Bill McKibben leads the Accelerate documentary. This is a film with an important and urgent message as we head towards a crucial ‘climate change election’ in Australia, and we want as many people as possible to see the movie as part of our Vote #1.5 election campaign. Will you host a screening of the shorter, 30-minute film in your community? The film files we provide aren’t suitable for screenings in cinemas. If you would like to organise a screening in a cinema, please contact us at community@350.org.au to arrange a DCP delivery to the cinema. Build a powerful climate movement in Australia. Contribute directly to cutting-edge campaigns to address the climate crisis.